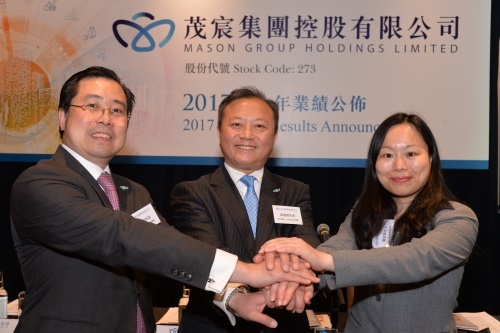 HONG KONG, Mar, 22 2018 - (ACN Newswire) - Mason Group Holdings Limited ("Mason Group" or the "Group", stock code: 273.HK) today announced its audited annual results for the year ended 31 December 2017 (the "Financial Year"). In 2017, the Group set a new strategy goal to establish an enterprise and financial mixed development, to be a diversified financial and healthcare service provider. The "Health + Wealth" growth strategy made a steady progress, and significantly improved its financial performance. The Group's operating income increased to HK$2,900 million in 2017, representing an increase of over 42 times compared with the same period last financial year. The Group saw a turnaround in its profit for the Financial Year, which stood at approximately HK$26.47 million, while loss attributable to the shareholders of the Group narrowed down greatly to HK$53.16 million from a loss of HK$472 million in last financial year. The continuous improvement in business performance was the direct result of the implementation of the "Health + Wealth" strategy and the decrease in the net fair value loss on financial assets held for trading. Mr. Joel Chang, Mason Group's Chief Operating Officer, commented: "We are delighted that the Group is continuing its transformation into a one-stop 'Health and Wealth Solutions Partner'. The Group's success during the Financial Year was reflected in the establishment of a "health strategy" comprised of medical, life sciences and mother-infant-child businesses, which were complemented and supported by the Group's flourishing financial platform. The integration of Mason Group's medical, life sciences, mother-infant-child ecosystem and financial platform not only enabled the Group to provide clients within the ecosystem all-rounded health and wealth solutions and care from cradle to cradle, but also paved the way for the Group to become a leading global financial conglomerate." During the Financial Year, the Group's efforts in its healthcare businesses started to bear fruit. Covering mother-infant-child retail, RNA/DNA analytics, assisted reproductive services and dairy products manufacturing, the significant strategic layout of a high-end medical and mother-infant-child business chain has been formed and developed into the whole-industry-chain, a prominent and uncommon business model among the industry. The Group will continue to integrate Blend and Pack into its ecosystem following its acquisition of the company, and will formulate a comprehensive and strategic ecological chain to export high quality and premium diary and nutrition products from Australia to Asia, with a focus on China. Strategically formulating a high-end medical and healthcare ecosystem, Mason Group bridged the gap between its mother-infant-child consumer platform of Aiyingdao and healthcare platforms by providing RNA/DNA analytics, genetic diagnostic services, assisted reproductive services and other high-end medical services to clients within the ecosystem. During the Financial Year, the Group re-structured and re-branded its molecule diagnostic operations to create a more premium brand image, reflecting the quality of the services it provides. The Group's assisted reproductive business has also been growing steadily, serving and caring for families with expertise and outstanding results. Hence, Mason Group has gradually been able to form its healthcare ecosystem, laying the foundations for its pioneering "enterprise and financial mixed ecosystem" business model. And, Mason Group has become the creator of the health and wealth ecosystem in the industry. Looking at the "finance" side of Mason Group's "Health + Wealth" strategy, the Group continued to expand its securities and futures brokerage business as well as securities margin financing, leverage and acquisition financing, corporate finance, wealth management and asset management services. Through the acquisition of Harris Fraser, a renowned wealth management company in Asia and Asia Pacific, and Raiffeisen Privatbank Liechtenstein AG, a Liechtenstein-based private bank, the Group has been able to provide a wider range of financial services, including asset management, corporate and trust services, investment saving plans, tax planning, life and general insurance and MPF advisory to a substantial and diversified client base that includes corporations, financial institutions and individuals in Hong Kong and throughout Asia. Through the provision of wealth and health management solutions, the Group has formed a closed-loop ecosystem to enhance the economic interaction between its finance and enterprise operations, allowing them to complement each other. The synergies generated are not limited to their own respective sectors, but can be felt across industries. The enterprise operation helps drive the finance operation forward, which in turn allows the finance operation to complement the work of the enterprise operation. Looking ahead, the Group expects the global economy to continue to recover, and believes that proposed new rules to make Hong Kong's listing regime more favourable for emerging and innovative companies will provide stimulus for Hong Kong's stock market. The Group also foresees increasing demand for mother-infant-child and high-end medical services as a result of China's new two-child policy and the improvement in citizens' livelihoods. The Group will continue to draw upon its extensive capital resources and experienced management team to further strengthen the Group's ecosystem by positioning it as a "Health and Wealth Solutions Partner", as well as providing one stop services covering daily medical services, education, parenting, financial management, investment and insurance that feed all needs of clients. As part of the Group's "Health + Wealth" strategy, it has expanded its financing channels, improved its financing structure and cost structure, and developed a synergy between its financial and enterprise operations to integrate and develop both its enterprise and financial services. Mr. Alex Ko, Chairman and CEO of Mason Group concluded: "The year 2017 saw steady progress across our business after we re-branded our corporate identity as 'Mason Group'. Riding on the success of 2017, we enter 2018 with a clear strategy. The Group will continue to stride ahead with its 'Health + Wealth' dual-core strategy, as the health sector looks to take off over the next decade, and we will seize the opportunity to move towards becoming a one-stop health and wealth management partner. We aim to generate steady capital inflows and a solid client base for the Group, while maintaining high standards of corporate governance so as to become an all-around 'Health and Wealth Solutions Partner' for its clients globally and provide solid rewards for the Group?s shareholders." Mason Group Holdings Limited (stock code: 273.HK) is a health and wealth solutions service conglomerate. It principally provides comprehensive financial services in Hong Kong, including financial brokerage services, leveraged and acquisition financing, asset and wealth management services and mortgages business. In addition, the Group provides innovative health solutions through its healthcare business, mother-infant-child business, and dairy products manufacturing business. Leveraging its "Health + Wealth" strategy, the healthcare business provides steady capital and a client base resource that support the rapid development of the Group?s financial services business.